Elana Bourgeois-Folse displaying many of the products at the store. 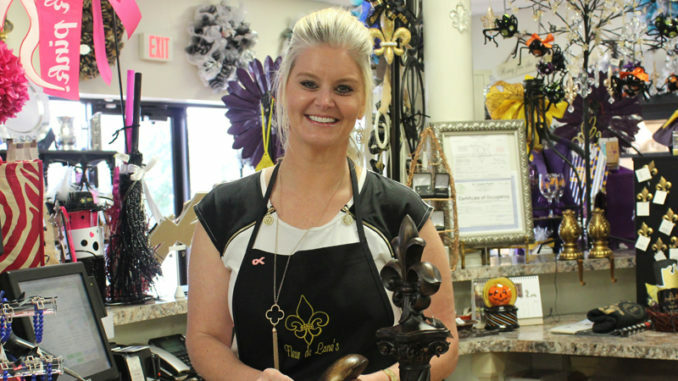 When Elana Bourgeois-Folse said she loved everything about St. Charles Parish, she was serious about bringing that home feeling to Fleur De Lane’s store. Of the many home décor items at the Boutte store, she said the hot sellers are home fragrances by Orleans Home Fragrances’ candle line, as well as Orleans’ Nu’ Wash fine laundry detergent. The Lampe Berger line, offering a wide variety, is a top product as well. A great part of their success is their focus on offering quality merchandise at great prices to customers. Bourgeois-Folse partnered with her mother, Thelma Dodson, to open the business at 14214 Hwy. 90 in Boutte. She considers it the best of both worlds by having a business and personal relationship with her mother. Also, Bourgeois-Folse said her mother loves to decorate, calling her a “design fanatic” and she wanted something that would let them both act on their passion. Store items include bridal gifts, baby items, fashion jewelry, kitchen, bathroom and outdoor décor, gift ideas of all kinds, as well as home fragrances. Bourgeois-Folse’s love for the fleur-de-lis combined with her own name is how the store got its name. In an equally fortunate turn, demand for anything with the beloved symbol exploded in Louisiana. From there, the success carried on through the mother-daughter team’s dedication to a high-quality product line, as well as the personal touch they show customers, such as bringing their items to the vehicle and making sure their customers feel welcome. Fleur de Lane’s is at 14214 Hwy. 90, Boutte, and can be reached at (985) 308-0328.